So after a week lost to a blizzard of explanations and clarifications, the FAI's gift - as ever - is to leave its audience squinting. That gentle, administrative glitch of a week ago somehow tripwired a convulsive series of statements (seven in eight days) culminating with the breaking story of John Delaney's curiously rushed re-deployment. 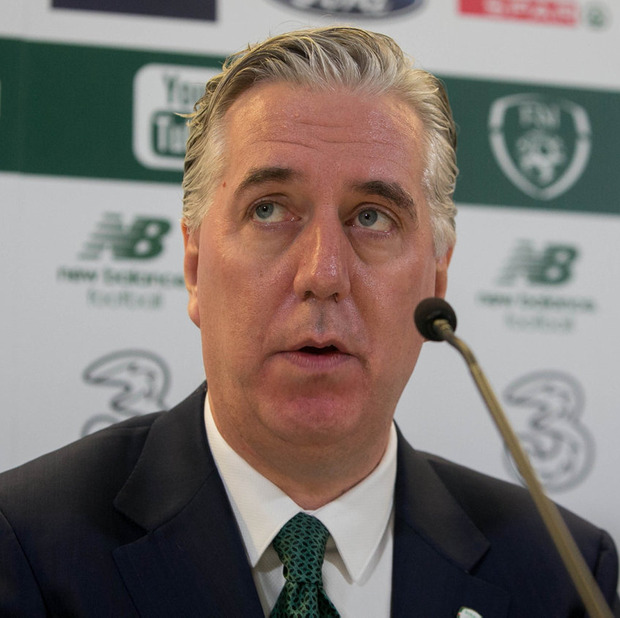 And Saturday evening's FAI missive simply reinforced the impression of an organisation subservient, intellectually at least, to the man now invented overnight as their shiny, new Executive Vice President. It made no reference, naturally, to that €100,000 'bridging loan' which, in the absence of any cogent explanation, surely goes down in history as one of the costliest acts of philanthropy ever known. While the dogs in the street were entitled to wonder why Delaney sought an expensive High Court injunction against reportage of his generosity, the Association's board members, essentially, signed off on an announcement that amounted to just sliding their lips over a few corporate cliches and dropping their eyes to the floor. That's long been their style. Their reflex. Crucially, Delaney's dramatic reinvention will not, it seems, affect his eligibility for that lucrative position he holds on UEFA's Executive. So move along, nothing to see here folks. As the policeman said outside the exploding fireworks factory. We believe this new position will see Delaney take a "substantial reduction in salary", but the Oireachtas Committee is surely still entitled on April 3 to explore the specific responsibilities of an Executive Vice President. Is there a shoe allowance? Certainly, the optics of the CEO stepping down so suddenly within days of that 'loan' being reported aren't easily reconciled with the Association's breezy suggestion that Delaney's reinvention is simply in service to a strategic report they'd commissioned for the 2020-2024 period. The findings of that report, Delaney himself revealed some weeks back, were not due for confirmation until next year. Why, then, enact it so abruptly on the night of Mick McCarthy's first game back in charge of your marquee team? Outside of football committee rooms, Delaney is an innately divisive figure. Soon after the departure of the chronically overpaid Martin O'Neill and Roy Keane last year, an online petition calling for his removal as CEO had gathered in excess of 20,000 'signatures'. While he has endeared himself to many rural clubs through a willingness to drive the length and breadth of the country, Delaney has been almost incontinently litigious with media critics, while supporters carrying banners in any way critical of his record as CEO have become accustomed to heavy-handed policing. Banners were confiscated in Belgrade three years ago and, again, in Aarhus last November, the night of O'Neill's final game as manager, with a Danish spokesperson insisting afterwards that their stewards had been "instructed by UEFA". Delaney, himself, denied any knowledge or, indeed, interest in such banners, though supporters in the Aviva 'singing section' have also long complained about similar confiscations being commonplace at home games. However, he is popular internationally, with his election on to UEFA's Executive last April endorsed by a landslide 48 out of a possible 54 votes. And, until this weekend's breaking news, his contract as CEO was due to run to an 18th year, by which time he'd promised the debts accumulated from the calamitously ill-conceived Vantage Club scheme would have been long erased. In many ways, there have been two parallel narratives running in the story of John Delaney and the FAI. Certainly his business acumen and confident communication skills sometimes seemed to fuse into something more jolting. He palpably enjoys the limelight, but not always with a conspicuous sense of adult self-awareness. That infamous act of throwing his tie into the crowd in Skopje remains an image of such vaulting self-regard, it all but flew beyond satire. So the challenge has often been trying to figure out the distinction between those supporters laughing with him (as he organised free beer on a train in Slovakia) and those laughing at him (that night of the disappearing shoes in Sopot). He is undoubtedly good company and a man (just like his old Olympic Council buddy Pat Hickey) sufficiently accomplished in business to communicate confident leadership. To that end, the public image of the FAI Board has long been one of compliant subordinates working to the CEO's bidding. 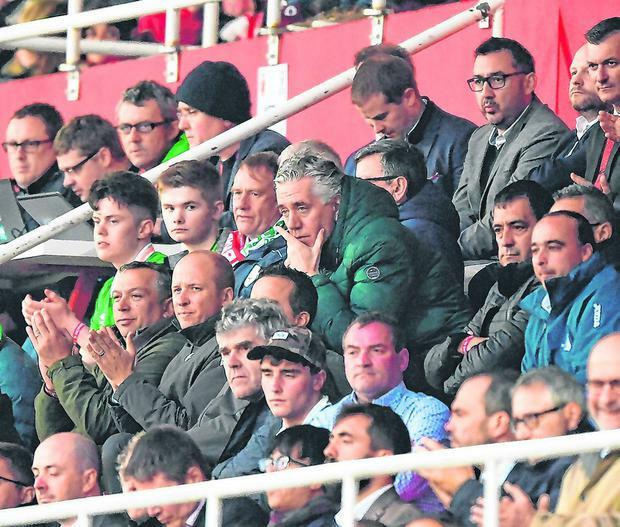 Yesterday's newspaper revelations that, for almost a decade, they paid the rent of one of Europe's highest paid sports administrators - at a time of widespread pay cuts and job losses within the Association - nourishes that very image towards the margins of black comedy now. Trouble is, Delaney has always seemed so much more accomplished than those around him. His climb through the FAI ranks was energised by a conviction that his father Joe had been harshly treated over that unfortunate business with 'George The Greek' in '94. By 2001, he'd followed in Joe's footsteps by becoming Association treasurer and, within a year, was established as the most visible and seemingly accomplished FAI executive through his handling, from home, of the Saipan fall-out. Three years later he'd become Chief Executive, a role he would hold without serious challenge until Saturday evening. In that time he often seemed frustrated that his colourful personality (that "misunderstanding" of his lawyers initially denying he'd been the man singing a Republican song after an international game in 2014) obscured what he consistently trumpeted as an Association serving its community extraordinarily well. Yet rumours of poor governance and a lack of transparency became a resilient soundtrack behind day-to-day FAI business. And Delaney certainly never quite seemed to grasp the absurdity of his explanation on RTE radio that the €5million 'compensation' payment that FIFA made to the Association in 2010 for Thierry Henry's World Cup play-off handball in Paris was to offset any potential legal action. How on earth could a refereeing error ever be the basis for a damages' claim in court? The payment was labelled "a joke" by the president of the German Football Federation, albeit Delaney could scarcely be lampooned for accepting it. He has, undeniably, a genuine passion for sport and, specifically, a devotion to Kilkenny hurling. This despite growing up in Waterford, being schooled (Abbey CBS) in Tipperary and getting his first business break in Kerry, where he began working in a bakery part-owned by family. The business was in trouble at the time both with Revenue and a health inspector, but the young Delaney reputedly turned it around by signing 10 post-dated cheques for the sheriff and charming the inspector. He has been quoted as saying he acquired most of his business principles from running that bakery. Claims that he has previously been courted by Fianna Fáil to run for election in South Tipperary or Waterford aren't entirely implausible given a clear political acumen. Because, for all the peacock inclinations, he is indomitably resilient and a man who knows how to work a room. Four years ago, before a friendly international with England, Roy Keane - a man with form in this field himself - was asked if he considered Delaney a distraction. "Isn't he always?" Keane replied. In Gibraltar on Saturday, maybe only McCarthy will have been thankful for the gift that keeps on giving. Vincent Hogan It was closing on 5pm in the photographers' room when John Delaney settled for the interrogation he always knew was coming, his back to the lockers, a black leather stool pushed tight towards his knees.